Remember the New in crates Notrun Commicals found in Belgium 5 years back? Do these amount to never rideable because classic protocol requires them to stay in their crates? I guess if you had all of them you could ride one and maintain the rest for posterity. Or, screw posterity! In the cities and large towns yes for sure, too much multiculturalism . Most Aussie country folk are saints. G'day Richard. I would say the depreciation would start as soon as their assembled. The only time I have to lock things up is 6 weeks at Christmas and 2 at Easter when the tourists are here. The rest of the time I usually leave the keys in the ute. Only once a few $ were taken from the dash by kids. I love living in the country. Yes, I remember when I lived in Coventry in a terraced type house. 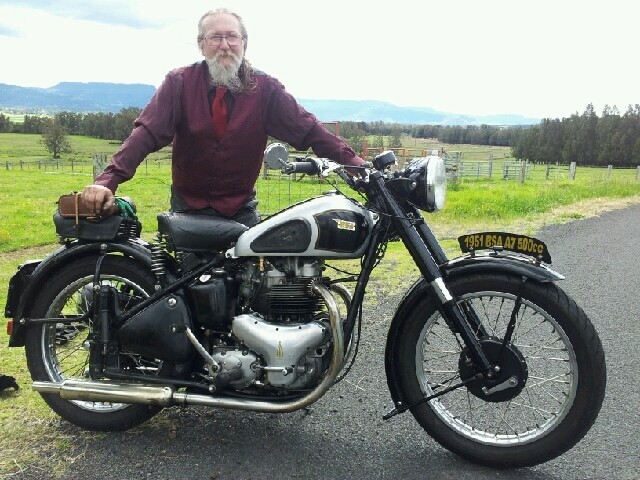 I had done some minor adjustment on the bike and was going to ride round the block to see if it ran OK. The bike was normally parked up my entry which I did not share with any other houses. As I was only going to be away for 5 minutes I left my bike security chain in the entry. By the time I got back the chain was gone! I had the opposite, just done some adjustments to the Shooter ,without thinking went back in for my gloves without putting the chain on the bike and came out bike gone ,chain still there !! didn't get her back for nearly 6 mths from the police near Keele services off the M6. The tow rag had been walking down our side street on his way south and thought oh that's handy and off he went , the b'tard got a puncture at the services after filling her up and just dropped her into the bushes ,the guy on the pumps noticed called the cops who picked the bike up and notified me it'd been badly crash damaged nearly 6 mths later, needed a new tube was all , aren't our mr plod wonderful. Page created in 1.78 seconds with 21 queries.